Vallartas won first place in Judges Choice at Horizons Specialized Services' annual Pick a Dish competition Thursday night in Craig. Restaurant owners Macho, left, and Roy Nunez stand behind Bobby Holmberg. Margarita Gomez also helped with the competition. When Joanna Hatten talks about working with Jason Latham, tears of joy fill her eyes. Latham is a developmentally disabled patron at Horizons Specialized Services, and he hugged Joanna, kissing her on the forehead, when she spoke about him. He’s worked with Joanna and her husband, Kelly Hatten, at their catering business in Craig called Hatten Enterprises for four years. The trio teamed up to cook Texas Egg Rolls and Frito Salad at Horizons’ fourth annual Pick a Dish dining bash Thursday at the Moffat County Fairgrounds Pavilion. Nine restaurants participated this year. The event has become a favorite of Moffat County locals, where they buy tickets to sample food made by various local restaurants who team with Horizons’ clients, giving them an opportunity to cook alongside local chefs. Latham, Kelly and Joanna won first place in the People’s Choice category. According to the nonprofit’s website, Horizons plays an important role in Northwest Colorado, helping individuals with developmental disabilities — including cerebral palsy, epilepsy, autism, or a neurological impairment — work and interact with society. The organization has been helping clients in Grand, Jackson, Rio Blanco, Moffat and Routt counties since 1975. Such confidence permeated through the building as the annual extravaganza had more than a dozen restaurants paired with Horizons patrons for the delicious cooking competition. Horizons has been helping individuals with developmental disabilities in Grand, Jackson, Rio Blanco, Moffat and Routt counties since 1975. This year, Wolf Mountain Pizza, a restaurant in Hayden, participated, along with one of its staffers, Crystal Denton. “Crystal has cooked for me for four years at Wolf Mountain,” said restaurant owner Charlie Epp. Denton is a client at Horizons who made Patch Chowder for their specialty dish. “We both came up with this recipe,” Epp said, noting that the soup they prepared is actually a garden chowder with potatoes, carrots, celery and onions in a cheese sauce. The pair won honorable mention in the competition. The event was broken out into two voting categories, People’s Choice and Judges Choice. Vallartas Mexican restaurant won first place in the judges category, giving the eatery clout that many in the community feel it deserves. 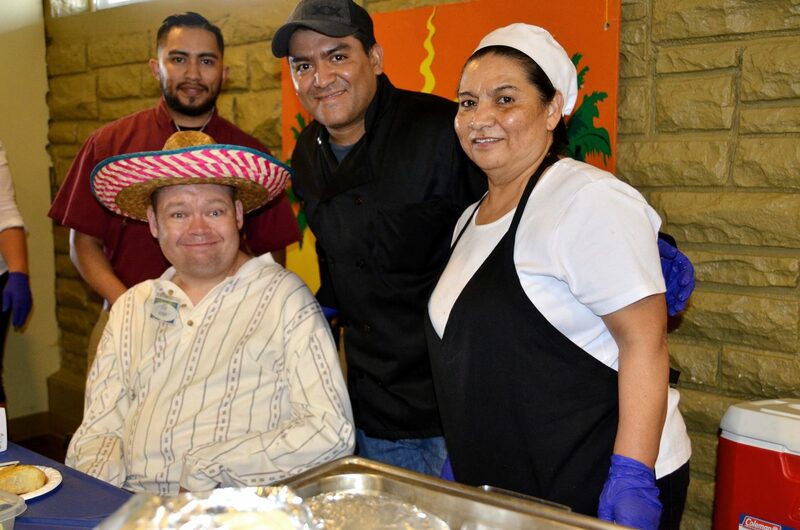 For years, the owners of Vallarta’s have done numerous fundraisers for residents with cancer, those who lost loved ones and for children, making them a key component to Craig’s long-time tradition of taking care of its own people. Roy and Macho Nunez own the restaurant and they teamed up with Bobby Holmberg to make pork tacos and homemade salsa. Lynda Overton, who has two children who are part of Horizons, said the event gave her daughter, JanaLee Nugent, an opportunity to do something she’s never done before — reporting. JanaLee interviewed all participating restaurants, wrote articles about them and posted her stories on Horizons’ Facebook page.